First of all, let me say thank you to Carolina from Expect Moore for inviting me to be a guest blogger this week. 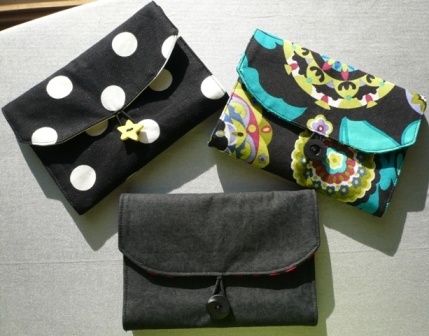 I can't wait to see all of her Pocket Week projects and activities, and I'm honored to be able to contribute my own! I am the proud owner of a brand new, shiny U.S. passport. I've always wanted one. I mean, how cool are you when they stamp where you've been in a BOOK?!? If I have to wait too long I might start stamping in it myself, which is probably against the rules or something. Of course, since I have a passport, I need something to put it in. I have a water-resistant case I'll be using and I wanted something I could slip into it that would hold my passport and some credit cards and other ID. Nothing I have or could find met my needs, so this little wallet was born. pattern - you can download the PDF of the pattern here. It's three pages, with four pattern pieces. The largest body piece has to be assembled. 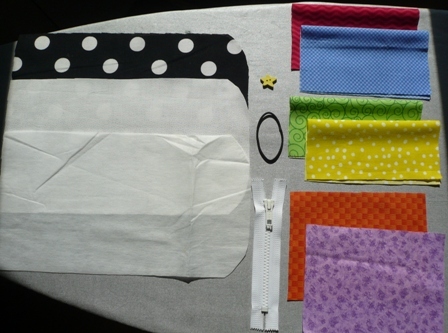 The fabric measurement is if all the pieces are cut from the same fabric. 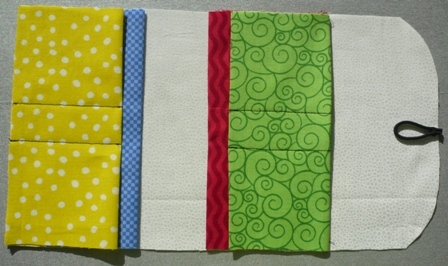 I would sooner stick a fork in my eye than miss an opportunity to mix fabrics, so you'll need smaller pieces of two or three fabrics if you feel the same. In the photos below I used a different color for each piece to make the tutorial clearer. A plastic, small tooth zipper works much better than metal or large teeth. A small piece of elastic will work just as well as a hair tie, I just like the rounded look of the tie. I preferred a flat button to make the wallet less bulky, but one with a shank on the back would work too. 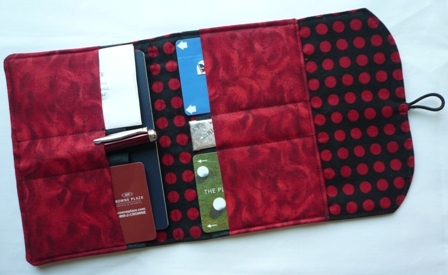 The finished wallet, folded up with button looped, measures about 5 3/4" wide by 4 1/4" tall. Cut out pieces from fabric. Cut the large cover piece from iron-on interfacing. Press the fold into the pieces that were cut on the fold. Iron interfacing onto the wrong side of the outside cover piece. 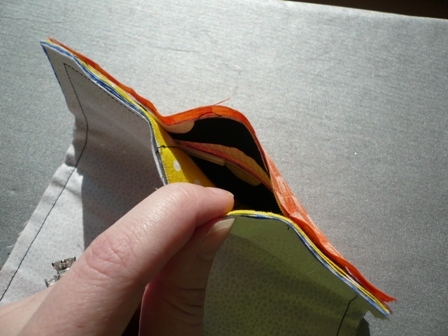 Draw the zipper opening onto the wrong side of pocket lining piece. Lay pocket lining over the squared end of outside cover piece (the one with the interfacing), lining up edges and right sides together. Make sure the zipper opening is nearest to the edge. Stitch around the outside of zipper opening. Cut along lines, cutting close to but not through stitching at corners. Pull the pocket lining through the hole. Pin, baste or glue the zipper into the opening from the back. Stitch the zipper in place close to edge of opening. Trim zipper ends close to stitching. 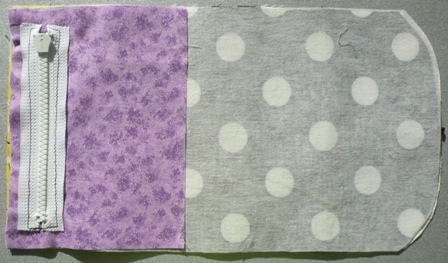 Layer the pockets for the both sides as they will be on wallet, raw edges even. 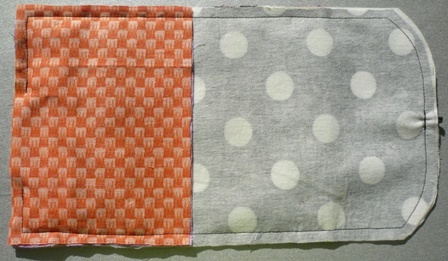 On both sets of pockets, stitch two rows, as shown on pattern, on smaller top pocket to create three slots. On the pockets for the side nearest the curve, zigzag stitch the bottom edge of the pockets, turn under ¼” and press. Lay inside cover piece right side up. 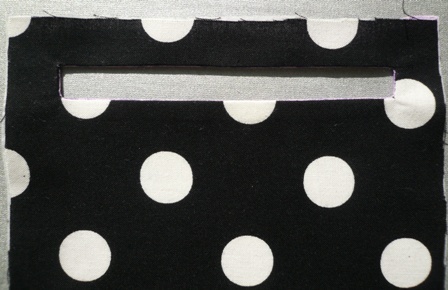 Layer the pockets on inside cover piece as indicated by solid lines on pattern. Stitch or tie a knot about 1” down on an elastic hair tie. Cut off excess and run ends over an open flame to melt to prevent fraying. Lay in the center of curved end with the loop to the inside. Lay outer cover piece over that, right side down. Lay second pocket lining piece on top, right side down. 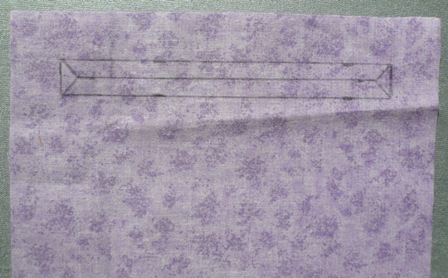 Stitch around outer edge, ¼” from edge, leaving a 2 1/2” opening for turning on the squared end. Backstitch several times over the elastic in curved end. To turn, look for the layer with the right side of zipper showing. Turn entire wallet right side out. Press, turning in edges of opening. Top stitch around the outer edge, across the bottom of right side pockets and down the middle between where the inside pocket openings meet. Fold wallet together. Mark inside the farthest point elastic reaches. Open the zipper and stitch a button on at the mark. Insert passport, credit cards, driver's license, hotel key card, some change, a collapsible pen and a stick of gum, fold it up and take it somewhere fun. This is the one that's going on my trip with me - in my favorite colors. Doesn't it make my passport look good?